In April 2017, OPEX Corporation introduced its latest technology, Sure Sort™, to the material handling marketplace. The launch of Sure Sort has spurred tremendous interest from end-users wanting to understand how and where this unique system could be applied to their operations. The purpose of this white paper is to answer the most commonly asked questions about Sure Sort and provide a high-level explanation of its most common applications. For manufacturing and retailing organizations, effective supply chain management impacts cost, service level, and quality. Distribution Centers are evolving to meet consumer expectations for fast shipping and delivery. Sorting is one of the more labor-intensive and expensive processes involved in filling an order. Sure Sort is a highly scalable, configurable, and cost-effective small item sorting system. Designed and manufactured by OPEX Corporation, Sure Sort is a robotic item sorter that easily handles a wide range of items – from cylindrical items to clear items and plastic bagged and blister pack items – to their final or intermittent order grouping in a single pass. Sure Sort’s compact array of sort locations can be scaled, sized, and customized within a small footprint. It is a cost-effective and efficient solution for packages under 5 pounds and within Sure Sort’s dimension specifications – 1.25 inches length and width minimum, and 15 inches in length maximum and 12 inches in width maximum. Oversized items can be manually processed into Sure Sort order totes. Manual processing may be appropriate where an object is too large to be handled by the Sure Sort. 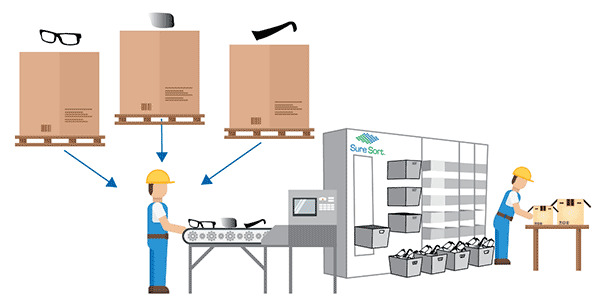 For example, objects which are too long or too high to be transferred by Sure Sort’s delivery technology – the iBOT® – may be manually scanned and the target “sort-to” destination can then be identified by the WMS and an indicator light can be illuminated so that the object can be placed into the order proper bin. By reducing the number of touches, transfers, and conveyance required to run existing sorters, Sure Sort provides a cost-effective way to sort items more accurately and efficiently. Capable of handling a wide variety of sizes and virtually any packaging type, Sure Sort reads barcodes on any side of items placed in its scan tunnel. Barcode information is sent from Sure Sort to a WMS (warehouse management system). The WMS sends a destination location to Sure Sort’s iBOTs which deliver items to their proper sort locations. Sure Sort is smart automation based on proven iBOT® delivery technology. This is the same technology that drives the OPEX Mail Matrix®, a specialized mail sorter introduced in 2005, and the OPEX Perfect Pick®, a goods-to-person order picking system launched in 2012. Designed with ergonomics in mind, Sure Sort is ideal for small businesses looking for a cost-effective entry into warehouse automation as well as large fulfillment operations looking to streamline their processes. A business that traditionally employs batch or wave picking delivers items to a designated sort area. A sorting process divides the items into individual orders to be sent to the pack and ship area. Order sortation is a labor-intensive process when done by hand or using a traditional put wall. The space requirement to use conventional sorter technology can be quite large and the range of items that can be handled efficiently can be significantly limited. Sure Sort uses robotic vehicles to increase efficiency, accuracy and speed of order processing at the sort area. Sure Sort sorts items at rates up to 2,400 items per hour. Sure Sort is also very space efficient as it uses the vertical space as well as the horizontal space it occupies. Sorting is a major expense for any warehousing/shipping operation. A majority of today’s warehouse and distribution operations employ manual techniques using “assisted technologies” such as hand-held scanners and put-to-light systems. Others use conveyance systems at varying levels of sophistication and complexity. In most organizations, the order fulfillment process begins when a picker is given a list of items to collect from storage aisles within the warehouse. The picker collects the items manually in “batches” containing multiple items for multiple orders to maximize use of the picker’s time. Once picked for orders, these items are brought back to a central location where the items for each order are consolidated, packaged and shipped. The problem is, order consolidation process at the packaging and shipping line is very labor intensive, inaccurate, and time-consuming. This is where Sure Sort can provide an impact. Throughput rate for traditional put walls averages anywhere from 200 to 500 items per operator per hour. Sure Sort can process up to 2,400 items per hour with three operators: one at the induction belt and two removing orders from trays. The industry applications of Sure Sort are virtually unlimited. Below is a representative list of successful applications of the technology to order fulfillment processes. Figure 1: Batch picked orders are consolidated for shipping using Sure Sort in the diagram above. Retail store distribution / Brick and Mortar – Efficient sortation and collection of orders to be distributed to retail stores, or even other DCs within your supply chain network. Figure 2: Items for shipment to stores and DCs are sorted into orders using Sure Sort in the above diagram. Parcel Sortation / Presort – Presorting by zip code or mail zone, reducing shipping charges since shippers will not need to presort their items. Figure 3: Small parcels can be sorted to the zip code level for shipping efficiency and to reduce costs. Kitting – Sure Sort can speed the process of pairing like items into multiple kits. Think: Subscription “Item of the month” clubs or “meal delivery” clubs, for example. Individual items can be inducted into Sure Sort and delivered quickly to order trays until all kits are filled with the desired items for that day’s shipment. Figure 4: Individual pieces can be sorted into orders. In the diagram above, product components are being sorted into orders, but kitting could include fulfillment of subscription box orders, or maintenance kits for field service personnel, for example. In the above example, a sequence of containers, each containing a single item (e.g., eyeglass frame, lenses of a particular shade, shape, and corrective prescription, and position in the frame) are received and their contents transferred to the conveyor. Each container may have a unique bar code or other identifier such that only a single scan of the container itself is required to make the sorting decision for each item in the container. Alternatively, the items may arrive at the workstation in a stream and scanned individually. When the last item to be sorted has been removed from the container, the next container is scanned. The process is repeated until kits comprising the proper quantity of each item have been assembled. Work In Process (WIP) – Companies which provide customizing services struggle with how to consolidate multiple customized items per order due to the variation of time/days needed for each customization process. Sure Sort can provide an accurate order collection point as each item customization is completed. Last Mile Delivery – The challenge for retailers wishing to capitalize on last mile delivery strategies is economically and quickly sorting a wide range of different type and size small parcels to the ZIP code level. Conventional sorting systems are too large and expensive to cost-effectively meet these requirements. locations according to their disposition. Cross-Docking – Some warehouses employ this strategy to speed the delivery of product to its end-point. Sure Sort can be used in cross-docking processes to sort materials to their end-point destination in the fastest time possible. In summary, Sure Sort is a cost-efficient, entry-priced scalable sortation solution with a wide array of applications across DCs in environments large and small, centralized and decentralized.